The Sd.Kfz.234/1 was produced in largest numbers. It mounted a 2cm cannon and mostly was used for reconnaissance duties. It was fairly fast at 80kph (48mph) and had a long range of 900km (560miles). The armor only provided protection from small arms of 7.62mm and shell fragments. It had a Tatra 103 engine, that was a 12-cylinder air-cooled diesel. 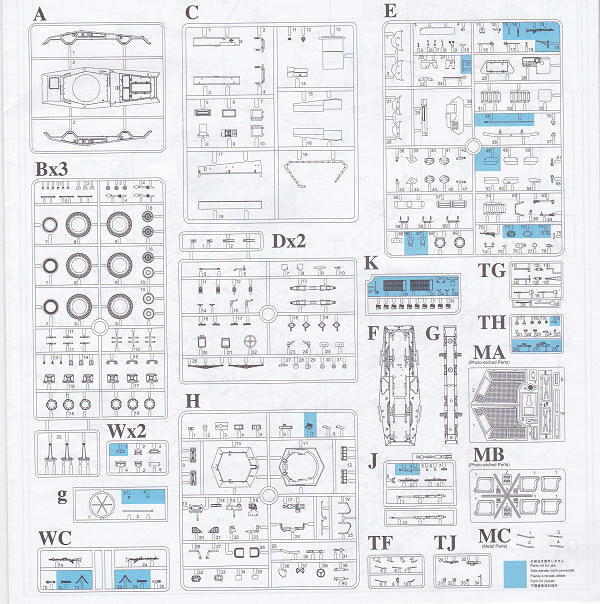 I nside the box are 532 parts (485 in gray plastic) 31 brass PE parts, 12 clear plastic parts and 4 turned brass parts. There are 2 decal sheets and the instructions complete the kits contents. Parts trees, decal sheets and PE frets are in 18 sealed cello bags in the kit. Very well protected therefore. The instructions consist of single sheet that accordion folds out into 10 pages in 7 ½” x 13 ¾” page format. There are 28 assembly steps. 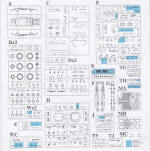 The parts illustrations have some parts in these illustrations shaded out in blue. Indicating that they are excess and not needed to complete the kit. Step 2 is the assembly of the suspension units. This is a very very busy exploded drawing and will have to be carefully studied and followed to get things correctly assembled. There is a lot of interior detail provided. However, the hull side doors are molded shut. Both driver’s positions are provided, the top of the transfer case and transmission and ammo bins with covers. There is internal bracing and clear parts for the vision ports. There are numerous ejector pin cup marks in the inside of bottom hull part on the floor. These will have to puttied up and sanded smooth. Much care will be needed doing this, so as not to harm the surrounding molded details. You have an option for the vents on the rear – opened or closed. The vision blocks also can be posed either way. The storage bins in the fenders are molded shut. The brass PE provides the center section of the jerry cans (actually a molded lip on the real cans), the mesh covers for the turret, a “Crows Foot” long range HF antenna to replace the plastic one if desired. The 2cm gun comes in 2 lengths. Why? I don’t know. The wheels have a nice tread pattern and are plastic, which eliminates the chore of trying to sand seams off ones that are vinyl in some kits. A spare 9th wheel is provided to mount on the rear of the vehicle. There are turned brass fender indicators in the kit. Overall molding of the parts is excellent, except for the ejector marks in the cabin floor. No crew figures are included. 2 marking and painting schemes are shown in the instructions. The first one is a vehicle of the 6th Panzer Div., Austria 1945 in overall panzer yellow as shown on the box art. The second one is for a vehicle of the 25th Panzer Div.,Germany, 1945. It is in overall winter white-wash, with no markings what-so-ever. I recommend this kit to modelers that have a few other AFV kits of this complexity under their belts. This kit is not for the novice and is definitely not a weekend project. I purchased my kit at a hobby shop that was terribly overstocked with plastic kits that weren’t moving for them. So, they marked them all down 50%. Always nice to get a bargain!